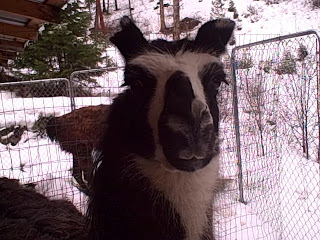 Well, today Nick the Black Llama arrived. He's a confident, sassy dude who has positively fallen in love with me. 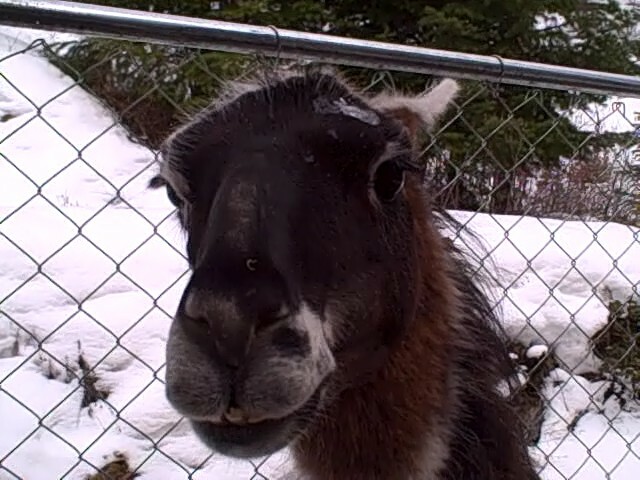 His former owner commented that he never allowed anyone to touch his head and he went and sniffed my breath and gave me a version of a llama kiss. Basically, he was very mellow and relaxed. You can see his new picture in the pen with Sid, I had put some field fencing between them so they could get used to each other. Nick, you may notice, has torn up ears. The rancher I got him from didn't know how it happened, but his ears had been pretty torn up when the rancher got him. They're fine and they don't cause him any pain. Which is very good. Sid, on the other hand, was pretty uptight about the entire situation. In spite of the field fencing, he started posturing and threatening to spit at Nick. Nick did the same back. I fed and watered them and hoped for the best. I went inside for a nap. When I went back with more food and water (I wanted to make sure everyone was happy), I found Nicky in Sid's pen. They were acting very calm until I came in. Then, Sid started acting like a butthead to us both. In desperation, I took Sid for a short stroll outside the pen. He seemed to calm down. It seems Nick took the bottom portion of the field fence down and slipped under. When I was away, they were acting okay. I've been checking on them at night and they seem okay when I do. When I was close by, Sid was really being an idiot. No llamas spit or hurt each other yet, but they were acting like two morons. The only thing I can think of is that Sid is desperately trying to guard or protect me from this new "intruder." But he's being Sid, which makes him skittish and less willing to put up with me trying to pet or handle him. Nick, on the other hand, is willing to let me handle him a lot, which makes me think he's really a people llama and not a llama who really was supposed to guard sheep, which was his job for 3-4 years. It's quite apparent that the rancher I got Nick from took decent care of him and didn't abuse him because he's not at all fearful or skittish. Nicky is about 8 years old. Looking at Sid and his behavior, I'm starting to rethink Sid's age. I think he's Nick's age or maybe a little younger because of what I'm seeing. He's lost a good portion of his gray hair with good nutrition and he's a bit more antsy than Nick. His teeth are cleaning up with his food too. I've been able to do things with Nick that has taken a long while to get Sid to do. It's okay, I understand Sid has trust issues, but it's really nice to have a llama who is more or less relaxed. Sid is better at commands and is good at walking; Nick, I think is fine, but he's less crisp and not good at pacing with the human yet. That's okay, again, I can work with that. Hopefully tomorrow I won't find bloody llamas, or either (or both) missing because Nick figured out how to get out of the pen. I think they'll want to hang out because of the food and because I'm here. I've already gotten a taste of herd politics and I think it's pretty silly. I'm going to get some more rocks and make certain they don't try to push open the pen. It should be set, but I want to make sure they can't muscle their way out. Today I decided to embark on the merry adventure of hot process soap making. I chose hot process soap because I would have soap ready to go once it was hard and I shouldn't have to worry about the lye that you need to worry about with cold process soaps. I decided to try a small batch today with tallow, coconut oil and palm oil. I chose to do a small batch first, even though I was ready to throw caution to the wind and make a huge batch, but something nagged at me in the middle of the night, and I decided discretion was the better part of valor, and planned on a small 8 to 10 bar batch. I may go smaller if this doesn't work tonight. First, the mistakes. Making your first batch of soap is a bit of a learning curve. For one thing, there's the oils. I planned on tallow because it's cheap and easy to come by, makes a reasonably hard bar, and it's the closest thing to venison fat I can find. Okay, then. Nobody told me that the tallow I got had meat in it. LOTS of meat. When I started melting the tallow, half the weight was in meat. So, I had to strain the cooked beef from the beef fat. That was mistake #1. Mistake #2 was putting the sieve over the smaller container which sat on the scale. You know what happens when you try to drain oil from meat and the meat plugs up the strainer? Okay, so I had to clean the scale. It still works. The Malamutes licked up what they found on the cabinets and floor. I ended up having to measure out half as much fat again with all of this. Mistake #3 Don't put your Kindle anywhere near the soap pot. Somehow, I got soap and fat dried on it. It cleaned off okay and the Kindle still works. Smart Idea #1: (Are you surprised I had smart ideas?) Do this outside. Really. The smell from the lye reaction would kill you if you're indoors. Those who do this inside are INSANE. Smart Idea #2: (That wasn't really needed) Wore a full face shield and latex gloves for handling the lye. No, I wasn't that klutzy, but I really could have been. Smart Idea #3: Hot plates. Yeah, it worked wonderfully. 1. Stirring. How much and how often? I seemed to think hot processed soap needed lots of stirring. Now that I reread the book, I think I stirred too much and things started doing okay all by themselves. 2. Timing: How long is long enough? I had no idea how long this was supposed to take. After a while, applesauce stage, mash potato stage, trace stage, etc seemed to not make much sense. In the end, after several hours, I figured that if the soap hardened when I poured a bit onto the mold and the lye didn't eat my skin, it was ready. We'll see about that. Today I went into town because I got a handle on a free scale to do weight measurements for my latest project: soapmaking. I got the idea to make soap when I noticed I had a lot of venison fat I collected for the sled dogs. Venison fat makes exceptional soap. But seeing as I can't get it except during hunting season, I've got to at least learn how to make soap, and that requires some kind of fat and oil. Beef tallow is readily abundant and probably the closest analogue, even though deer fat has a higher melting point. That was ridiculously easy to get, so the next problem I had was a scale. I decided to ask the good folks on the Missoula Freecycle and one fellow came up with an outdated electronic postage scale. I picked that up today. I had promised the guys at the warehouse where I got the shavings for my animals that I would pick up the bags. I was looking around and found the perfect wood there for soap molds: an old column from a house that was missing a side. The guys are hooked on my chicken eggs and without any persuasion, they cut the soap boxes down and even cut the backs and fronts for me to nail. I got all of it at an excellent price and now I don't have to pester my husband to make them. What's more, one of the guys is married and his wife does essential oils. She's hooked on my chickens' eggs too. I owe these guys eggs. The chickens had better get laying. As if that wasn't good enough, I found organic coconut and palm oil at my grocery store as well as organic essential oils on sale. Wow. Tomorrow is soap day. If this really works out, I may be selling some.